More than 43,000 employers have auto-enrolled their staff, but nearly half said they wished they had left more time. From April 2015, 300,000 savers who retire will be able to access their defined contribution (DC) pot from 55. Individuals will also be able to pass on their unused DC pension savings to any nominated beneficiary instead of paying the 55% charge. More than five million workers in the UK have already been auto-enrolled into a workplace pension scheme. The first workers were auto-enrolled in pension schemes in 2012 starting with the largest employers and the duties will extend to the smallest firms and new employers by 2018. The policy was introduced to address the problem of under-saving, with millions of British employees not putting aside enough for retirement and only one in three private sector workers paying into a workplace scheme. Despite fears of mass opt-outs, the programme has been an unexpected success: around nine out of 10 of those auto-enrolled have stayed in their workplace pension. Nevertheless, as the roll-out progresses, some fine tuning is under way. The Department for Work and Pensions (DWP) has just closed a consultation on technical changes to auto-enrolment which aims to simplify the auto-enrolment process and reduce burdens on employers. The DWP wants to ensure that those who will benefit most from pension saving continue to be auto-enrolled and that there are no unintended consequences for individual savers. The new provisions are expected to come into force in April 2015, and not a moment too soon for the 1.25 million small and micro employers who need to comply with their new workplace pensions over the next three years. Start your preparations in good time is the strong message from the Pensions Regulator's executive director for auto-enrolment, Charles Counsell, who says: "More than 43,000 employers have auto-enrolled their staff into a pension and nearly half of them said they wished they had left more time as it took them longer than they thought. We encourage all employers, however small, to learn from the experience of other employers – leaving extra time is better than leaving it too late." While initially taking something of a softly, softly approach there are signs that the Regulator's "educate and enable" stance is toughening up. In addition to issuing 162 compliance notices, which give employers a deadline to take action last year, its recent issuing of fixed penalty fines to three employers marks the start of a new phase of regulatory intervention. Counsell says: "As we deal with smaller employers, we will see more who, despite our message to prepare early, leave it too late or do not comply at all. This type of non-compliance is not acceptable. We expect to see the number of times we need to use our powers increase." Auto-enrolment is only one aspect of the pensions revolution. From April 2015, 300,000 savers who retire each year will be able to access their defined contribution (DC) pot as they wish from 55, subject to their marginal rate of income tax, instead of the current 55 per cent charge for full withdrawal. Such a radical relaxation could lead to pension scams and people blowing their windfall on the fabled Lamborghini. So the government has introduced a free guidance guarantee service, "Pension wise: Your money. Your choice", which will be a first port of call for consumers, offering free and impartial information and guidance to people with a DC pension approaching retirement. Pensions expert Ros Altmann says: "This project is still a work in progress. The Pensions Advisory Service and Citizens Advice Bureau are hurriedly trying to sort out further details and recruiting new staff. They will be running pilot schemes prior to April, to learn what works well with the public. In fact, people can register their interest and potentially take part in the pilots by visiting www.gov.uk/pensionwise." Members of defined benefit (DB) schemes can transfer out to take advantage of the new reforms. Some surveys have shown as many as 30 per cent of DB members may wish to do so which could strain the fund's liquidity, but Jonathan Watts-Lay, director, Wealth at Work, said: "Some companies will see the opportunity of transferring DB to DC as a way of managing deficits by offering very attractive transfer values." All individuals transferring out of a DB scheme must take advice from an FCA-authorised adviser. Adrian Murrell of Towers Watson explains: "In practice, this is merely a formalisation of existing processes, as members would almost always have received advice anyway, as the majority of DC providers currently would refuse to accept a transfer without advice." It will also now be possible to hand down a pension pot to the next generation. From April 2015 individuals will be able to pass on their unused DC pension savings to any nominated beneficiary when they die instead of paying the 55 per cent charge that currently applies. If the individual dies before age 75, the beneficiary will pay no tax on the funds. 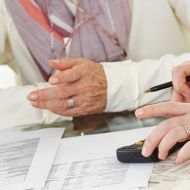 If they die after age 75, the beneficiary will pay their marginal rate of income tax or 45 per cent if the funds are taken as a lump sum payment. From April 2016, lump sum payments will also be taxed at the recipient's marginal rate. In the Autumn Statement the government decided to extend this to annuitants. From April 2015 beneficiaries of individuals who die under the age of 75 with a joint life or guaranteed term annuity will be able to receive any future payments from such policies tax free. The tax rules will also be changed to allow joint life annuities to be passed on to any beneficiary. These mean that people will no longer have to worry about their pension savings being taxed at 55 per cent on death. This will be another busy year for pensions specialists.